THE ANSWER: Any color you want. Did you know there is a rule about your pickleball clothing? There is and it’s been in place for a long time. It is Rule 2.F.1 in the IFP Rulebook. Rule 2.F.1 states very simply, very straight forwardly and without exception that a player may wear any color shirt he or she wishes to play in during a match. Some people try to scream distraction when they claim a shirt color made them miss a shot, but the rules are very clear. If the ball gets lost in the sun, is that a distraction? If the ball comes out of a shady part of the court into a sunny part of the court and you can’t see it right away, is that a distraction? A distraction is an act that causes you to lose your attention or focus. (not lose your sight of something). Waving your arms purposely to cause a person to miss a shot is a distraction. As for clothing, wearing a long handkerchief around your wrist that flops in the breeze or a hat that has bright flashing lights can be deemed a distraction. These are things that are purposely worn to distract. Not cool and not within the rules. This is v ery different than losing sight of the ball in the sky or in a background or yes, in a shirt. As a matter of fact, the IFP even defines Distractions in section 12.H and clearly it does not pertain to colors of clothing or paddles. 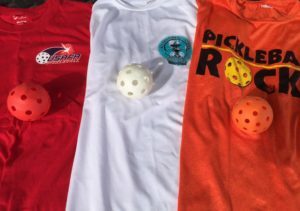 Now remember, if you play a social match or a match in an unsanctioned tournament, you may run into local rules and exceptions, thanks to tournament directors who may not care about maintaining the International Federation of Pickleball’s rule. I have nothing against playing in those local tournaments. They are great for the growth of pickleball. Just PLEASE don’t take those local “not-rules” back and teach them to your community or club. SIDE NOTE: That’s how we end up with so much confusion and so many mis-interpretations of the rules. Let’s let the ball bounce twice instead of just once before we hit it. Let’s be allowed to step your foot half way in the kitchen when taking a volley. What can it hurt? Let’s deduct a point from our score if we hit more than two net dribbler winners per game. Seems fair, right? So let’s make it a rule. Oh by the way, if a white ball is used in match play, let’s not allow white shirts. Same thing for the new red balls. Let’s not allow people to wear red shirts then. See how silly and out of control things could get if you allow everyone to interpret or make the rules the way they deem is best for their version of the game. What a mess we’d have. With pickleball growing so fast, we all have a responsibility to make sure the rules are used. Tournament directors of sanctioned tournaments have a responsibility to enforce the rules, not re-interpret them. I haven’t had an opponent’s shirt win or lose a match for them yet. I personally tend to focus on my opponent’s paddle so I can pick up the ball quickly. So wear any color you want. It’s a rule and will likely always be a rule. 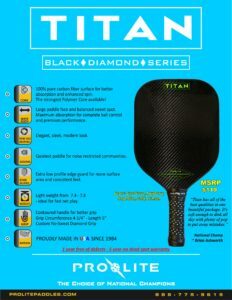 Thought I’d share some thoughts with you about the new Pro-Lite Black Diamond Series TITAN Pro pickleball paddle. Yes, that’s a long name. It is simply the TITAN Pro. 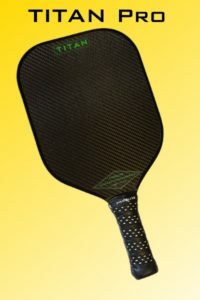 And apparently is the first in a series of paddles heading to market from Pro-Lite Pickleball. Anyhow back to the story. In January and February I used the TITAN in four tournaments and magically picked up six medals. Yep, 6. Soon after that, I also got a call from the USAPA to move me up to 5.0. Unbelievable. So, the bottom line is, it is an absolute game changer. To quote Sarah Ansboury the first time she tried the TITAN, “It’s the first paddle where it feels like my tennis strings.” The feel and touch is incredible, yet still has all the power needed to get the job done, emphatically. So if going to the next level of pickleball is your goal, the TITAN is the paddle to do it. I absolutely love mine. It’s no secret that pickleball in growing at an astronomical rate in the United States and beyond. Now CBS Sports has caught on as they are set to broadcast the Gold medal final highlights from the recently completed US Open Pickleball Championships in Naples, Florida. Set your video recorder for Friday May 20th at 7:00pm est or Monday May 23rd at 7:00pm. It should be a great hour of high level play from some of the best pickleball players on the planet. Don’t know your local CBS Sports Network channel? Here is a quick link to easily find your channel in your area. Grab the popcorn, sit back and enjoy the show, because as you already know…..